Golf is an exhilarating game that comes with a lot of benefits, especially for older persons. Most of the time, older people use this game to close business deals and earn themselves a lot of money. They even make bets while they are on the field. Besides making money, golf is also a great way to help people get their minds off the stress of their daily activities. Many older golf players started playing this game at an early age. When they look back to the time of starting to play golf, they will recollect how good they were at the game. However, as time goes, the sport begins to tell on their body, and they can see how their performance is starting to decline. Age does not mean you have to quit the game, but instead, there is always a way to keep enjoying this sport you love. 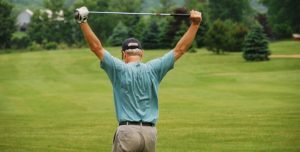 Golfers that are over the age of 50 will need to do regular exercises to allow their body to become flexible, and also to strengthen the spine. They need these exercises to keep them supple, so they don’t end up with injuries to their hips and back, as well as their shoulders. It is usually recommended that older people do stretching exercises to maintain their flexibility. Some of these stretching exercises are as follows. To try and improve the effectiveness of your swing, you can do stretching exercises with dumbbells. The thing about dumbbells, is that it will add strength to your muscles. One basic fact about being fit when golfing is that you have to be consistent. If you want to keep a flexible body to help you get the best swings, then you have to exercise regularly. Other stretching exercises you can do, include stretching your hips by doing either a hip flexor stretch, or you can exercise your hips while seated. Also, doing squats will help give flexibility in areas around your hips and lower body. All these stretching exercises are what will help you as you get older, so you can still continue to win when playing golf. The primary benefit you get from doing these exercises is that you will be flexible enough to do a perfect, and straight, swing. It is also essential for golf players to change their equipment and accessories as they age. It is better to substitute your long irons for hybrids, and even, to use other golf equipment, that will feel comfortable enough to help you get the perfect swing.